Widely grown throughout the south, Midwest, and even parts of California, pecan trees are large, bountiful trees that produce a beautiful selection of pecan nuts. These sumptuous trees require plenty of sunlight and warm temperatures to thrive. For many, growing pecan trees is quite the hobby, for not only do they produce a delicious snack, but their large size makes them excellent shade trees. If you love to garden and love to bake up some pecan pies on the weekend, growing a pecan tree might be the next project for you. However, just like any tree species, there are many different pecan tree species that thrive in different climates. Finding the tree that will survive best in the area you reside in is the trick to a bountiful, long-living tree. For pecan trees in Georgia and throughout the US, contact Georgia Pecan Nursery, today. Georgia Pecan Nursery is dedicated to providing our customers with an outstanding level of quality, service and competitive pricing. Whether you are a homeowner or commercial grower, we’re here to help you achieve your growing goals. Learn more about our pecan trees for sale. The trick to finding the perfect pecan tree for your specific location is looking at the climate zones. According to the US Department of Agriculture’s Plant Hardiness Zone Map, pecan trees can survive in zones 6-9, sometimes zone 5 as well. Though the zones can fluctuate, zone 6 and 7 vary from the west coast to the east coast, while zones 8 and 9 are predominantly located in the south and California. Most pecan farmers recommend looking closely at the US Department of Agriculture’s Plant Hardiness Zone Map first and finding a pecan tree species that does well in that zone. For those living in the Kansas and Missouri area, some farmers suggest investing in a Kanza, Hark, or Shepherd pecan tree. Kanza pecan trees can still breed in colder climates and have a high productivity of smaller pecans. Kanza pecans have a more pronounced roundness to them. Shepherd pecan trees are labeled as a type 1 pollen producer and grow pecans that are scab resistant. So, if you happen to have springtime allergies, the Shepherd pecan tree may not be the best option for you. The Hark pecan trees are similar to the Kanza since they produce pecans that are more rounded as well. 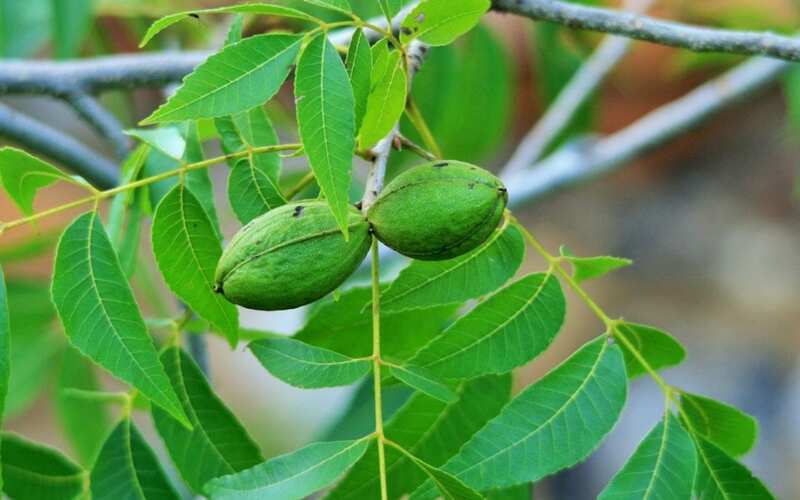 If you live in North Carolina, you’ll want to do some research on the Amling pecan tree loves a lot of sunlight and has an early harvest season between September and October. The pecans produced are long and covered by a thin shell. These trees are also scab resistant. The Elliot pecan tree happens to be very popular in Georgia, Florida, and Louisiana areas due to its abundant harvest. These pecans are tear-dropped shaped and very smooth to the touch. They also exude a unique sweet, buttery flavor. And the list goes on and on! If we start naming all the pecan varieties and the areas they grow best in, we’ll have you reading this all night! Once you have selected the pecan tree that thrives best in the area you live in, it’s time to plant it! Be sure you dig a hole of at least 5 feet deep and that’s 60-80 feet away from other plants and trees. These trees grow strong and burly, so you want to make sure their roots have plenty of room to spread. With plenty of water, sunlight, and fertile soil, you’ll have a sturdy, bountiful pecan tree in no time.